Want banana bread right now? Yes you do! 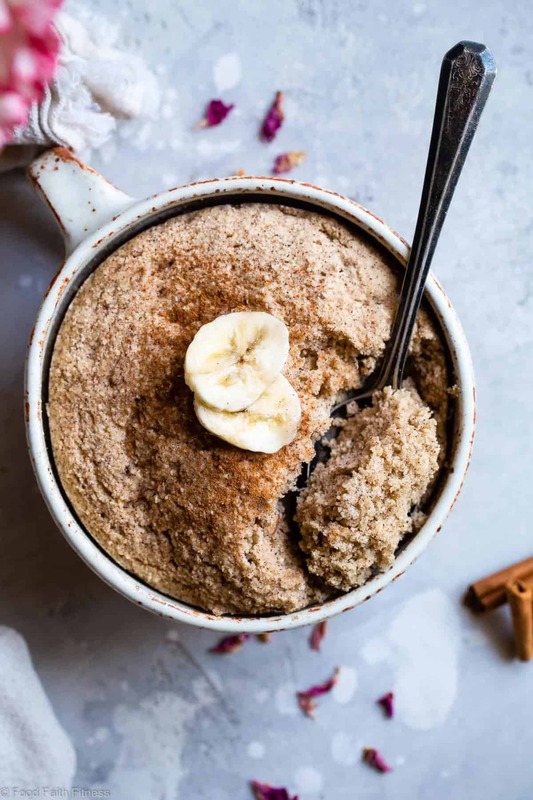 Make this 5 minute, healthy, gluten free and paleo friendly Easy Banana Bread in a Mug Cake Recipe! You and I both know that you can’t just go from 1 to 10 on the scale of “don’t want paleo banana bread” to “BANANA BREAD RIGHT NOW AND NO ONE GETS HURT” instantly because it takes TIME and PLANNING to make classic banana bread happen. 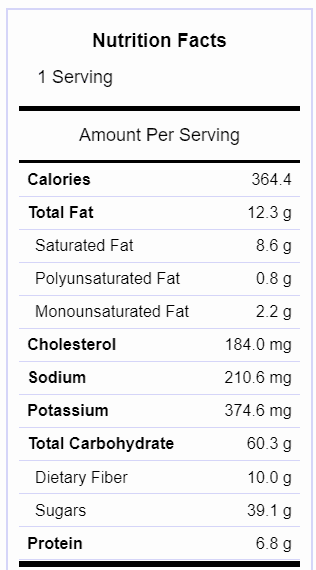 Good thing this is a banana bread in a MUG recipe. TBH, I am not really sure if you would ask that question but let’s not get hung up on the details. 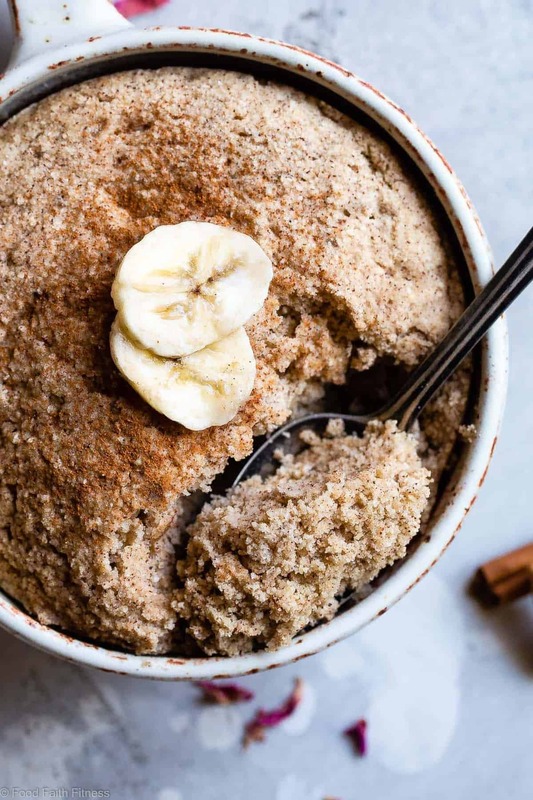 The beauty of the banana bread mug cake is that it has bananas, which are fruit (duh), which makes it socially acceptable to make for breakfast. How-EV-er, it’s also a cake, which means you could eat it for dessert. 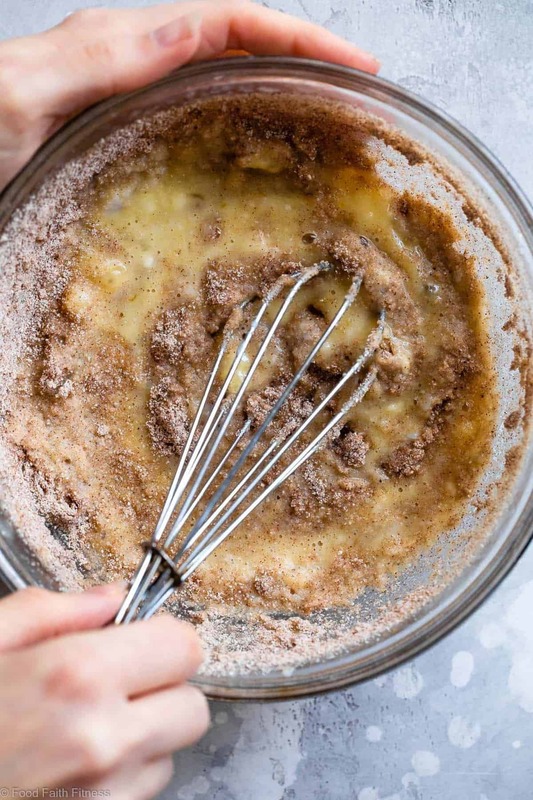 Basically, this microwave banana mug cake spans ALL spectrums off your food-eating-real-person life and has the ability to bring you SO much joy at any time of the day. Even if you chose to live on the edge! Tap into your rebellious side! And (GASP!) 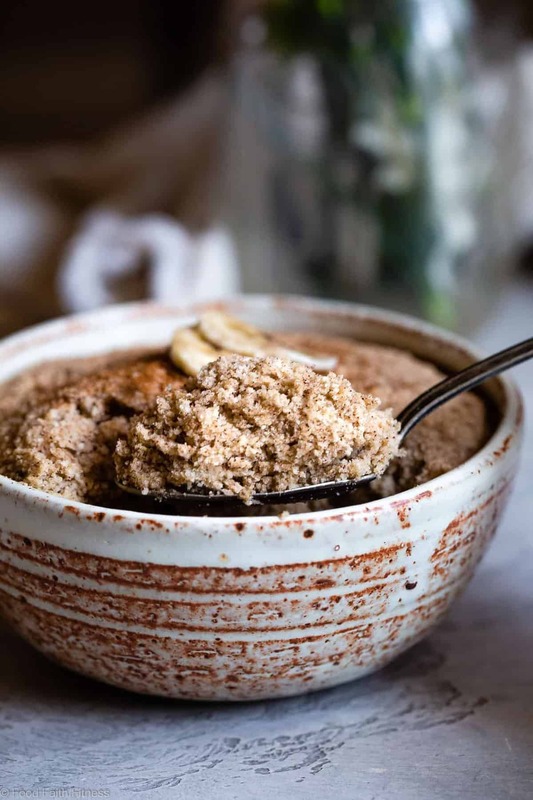 make this ultra-super EASY banana bread in a mug cake recipe for DINNER, you would still be happy. In other news, unlike fancy-and-HARD-sounding paleo banana bread cake with chocolate almond ganache, mug cakes are the easiest, most-idiot proof cakes that you will ever make. Period. END OF STORY. Mix the dry ingredients for your mug cake in a small bowl. 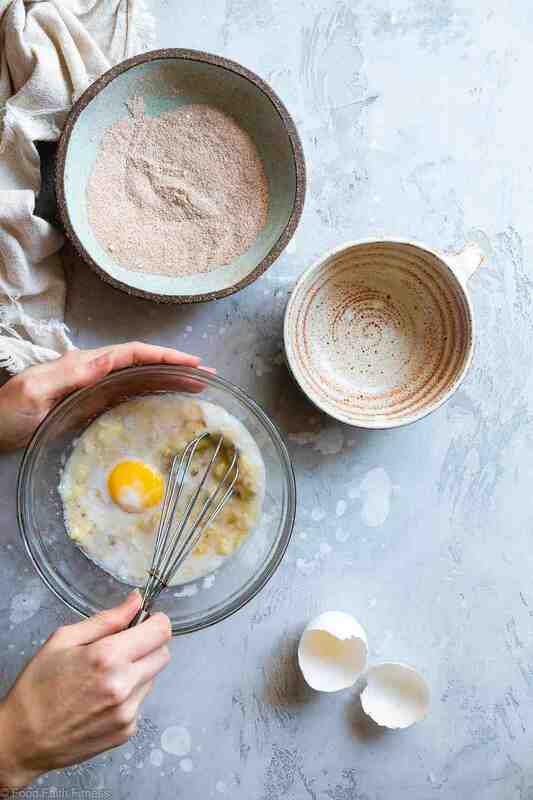 In a separate small bowl, whisk together all of your wet ingredients until smooth. Then, stir in your mashed banana until well mixed. Cook until the top has risen and set, and any wet spots are no bigger than dimes. This will vary based on the wattage of your microwave, so keep your eyes peeled! Get it. Peeled? Like bananas. That’s IT. Then you get to go to TOWN and bask in the warm banana bread glow of the current cake situation that you find yourself in. I think you’re going to find it very aPEELing. I also shared the easy banana bread mug cake recipe on Food Fanatic, so be sure to check it out there! This easy banana bread in a mug cake is perfect when I have a craving but don’t want the loaf around all week. I can’t wait for my bananas to turn ripe so I can make this! I hope that you love it Kelly! Oh my goodness. Five minutes to banana heaven! Looks delish. Oh my goodness does this look amazing! I love single serving mug cakes and this is happening soon! I hope you love it Kim! Oh my goodness! You really nailed it! 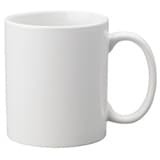 I can’t believe that I can have banana bread in a mug in no time! That’s just genius! Yes! Glad you like it! Definitely making this for breakfast tomorrow morning! Banana bread is one of my favorite desserts that I took a break from for a few years (probably because my mother made banana bread every week for three years straight, haha). Since returning from Maui last year, I am in love with banana bread again. I really want to create a single-serving banana bread dessert–a banana bread mug cake sounds great! 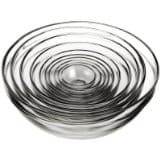 I’ll see if I can add a vegan spin onto your recipe–it already looks perfect! I hope you love it however you try it! Total Banana bread fan over here! I Love banana bread, and I love that no new recipe of it is every not exciting!!! I hope you love it pretty lady! I am excited to make one of my favorites in a unique way! Thank you!! Question: can a whole egg be used, rather than just the yolk?